ADDIS ABABA (REUTERS) — At least 23 people were killed in a weekend of violence targeting minorities in the ethnic Oromo heartland near Ethiopia’s capital, Addis Ababa, police said. It is a blow to new reformist Prime Minister Abiy Ahmed’s efforts at reconciliation. 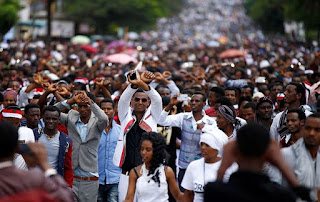 The violence escalated on Saturday, the day of a rally marking the return to Ethiopia of leaders of the exiled Oromo Liberation Front (OLF), which had waged a four-decade insurgency for self-determination for Ethiopia’s largest ethnic group. Abiy, himself the first Oromo leader in the ethnically diverse country’s modern history, has been pursuing a reconciliation strategy since taking power in April, steering the state away from a hardline security policy in place for decades. In the latest unrest, local residents said shops were looted and people attacked by mobs of Oromo youth who stormed through streets targeting businesses and homes of ethnic minorities on Saturday after two days of sporadic attacks in the Oromiya region’s Burayu district northwest of Addis Ababa. "Mobs of ethnic Oromo youth then marched here in Ashwa Meda and attacked our homes and looted businesses chanting ‘Leave our land!’," said Hassan Ibrahim, a trader in an ethnically diverse part of the district, said. "By night time, there were several dead bodies along roads," he said. Another resident said some of the violence was carried out by people returning from Saturday’s rally in support of the returning OLF leaders. The OLF did not immediately comment on the unrest. Alemayehu Ejigu, head of Oromiya region’s police commission, said that 23 people were killed in the latest violence and more than 70 people were arrested. He denied accusations that police were slow to respond. The Oromo have long complained of being marginalised during decades of authoritarian rule by governments led by politicians from other smaller ethnic groups. In recent years the Oromo have been angered by what they see as encroachment on their land. Since taking power, Abiy has lifted a state of emergency, freed political prisoners and removed leaders of banned groups including the OLF from a blacklist, paving the way for their return to the country. Abiy’s chief of staff, Fitsum Arega, said on Twitter that the prime minister "strongly condemns the killings and acts of violence against innocent citizens around Ashwa Meda, Kataa and Fili Doro last night. "These cowardly attacks represent a grave concern to our unity and solidarity of our people and will be met with appropriate response," he said. On Monday, hundreds of people staged protests outside parliament, the central square, the headquarters of state television and other places in the capital, demanding justice. "Our homes were destroyed and our women raped simply because we belonged to another ethnic group. Yet the government is yet to respond properly," said Atnafu Worku, one of the demonstrators.